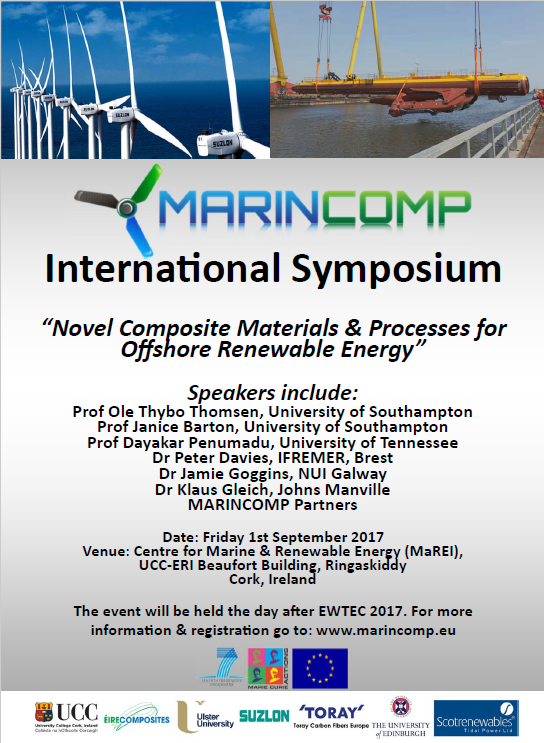 A 1-day International Symposium will be held in Cork, Ireland on September 1st, 2017 on the topic of “Novel Composite Materials and Processes for Marine Renewable Energy”. The symposium is being organised by the consortium behind the EU FP7 Marie Curie IAPP project MARINCOMP, led by University College Cork and the University of Edinburgh, and involving partners University of Ulster; Toray Carbon Fibers Europe, ÉireComposites, Suzlon Energy and Scotrenewables Tidal Power. Symposium topics will include development and use of carbon fibre and glass fibre reinforced composites for use in marine renewable applications such as tidal and wind turbine blades, involving novel powder-processing routes, fibre-matrix interface studies, water absorption effects on material properties, fatigue durability life design tools, 3D reinforcements, materials testing and characterisation, blade design methodologies, blade manufacturing cost models and structural testing of large composite blades. The symposium will be held on Friday, September 1st, from 9.00am to 5.00pm in the Centre for Marine & Renewable Energy (MaREI), UCC‐ERI Beaufort Building, Ringaskiddy, Co Cork and will follow the holding of the 12th European Wave and Tidal Energy Conference 2017 (EWTEC 17) in Cork from August 27th to Thursday August 31st. Attendance at the symposium is free, but space will be limited.